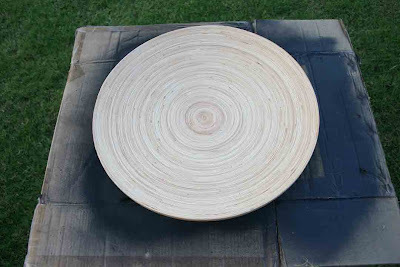 Today's Before & After project is a huge - and fairly flat - wooden bowl I found at the thrift store. It's about 17 inches in diameter....huge, I tell ya! Here is the 'before" stage...just prior to the bowl coming face to face with a can of black spray paint. 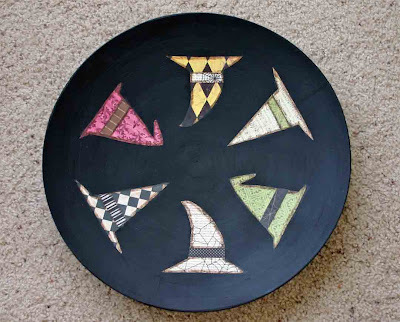 So after I painted the bowl, I found some premium papers and cut them in different shaped witches hats. I inked them up, adhered them to the bowl and then sealed it. 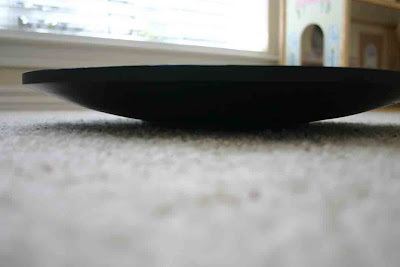 Here is a profile shot of the bowl so you can see how shallow it is. It will work great for Halloween candy...or just being on display. More projects in the works! Come visit again soon!